Why am I posting underwear pictures? Well, first because the underwear is pretty and covers more than most modern clothing and second to do my part to dispel the myths about corsets being damaging or uncomfortable. Each time period has different underpinnings that were used to shape the body into the fashionable shape. I personally feel that clothing of the past was far more egalitarian since these underpinnings helped women (and even some men) shape themselves into the fashionable silhouette of the day versus today where if you don’t look like an anorexic you will never be able to wear current fashion! Proper underpinnings are essential to having the right look and even the right feel for your outfit and your impression as a whole. I still need to acquire or make better hoops so I will add those pictures when I have better ones to post, but for now see how comfy my light linen chemise is and how it meets the needs of the low wide neck and short sleeves of a ball gown but can also be worn under day dresses. 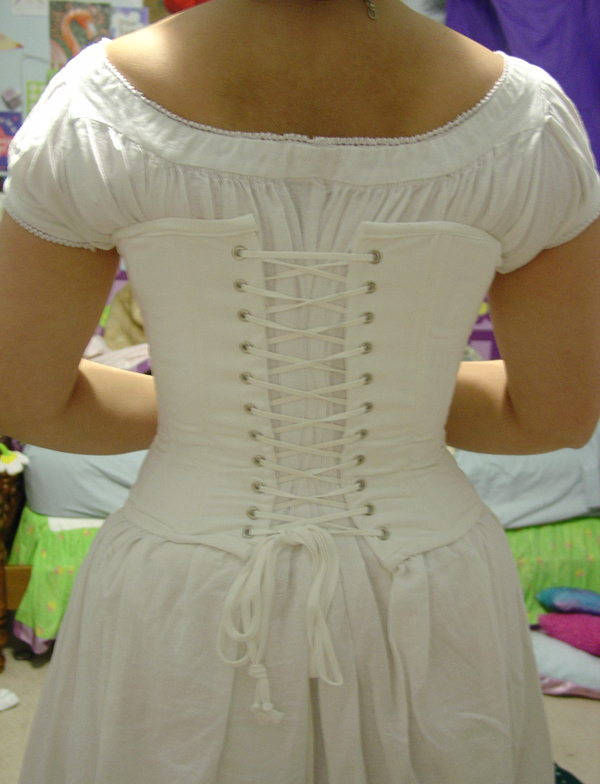 Also see how little the corset pulls in at the waist, it really is more about lifting the bust that cinching the waist. Of course, I could wear it cinched tighter but this is comfortable for a long day’s wear and an evening of dancing.